A common concern growers may have when they move to a no-till system is nutrient stratification. Without tillage to mix fertilizer into the soil, no-tillers may wonder whether the nutrients applied to the soil surface are reaching the crop roots. According to University of Nebraska Extension engineer Paul Jasa and Ray Ward, plant scientist and founder of Ward Laboratories in Kearney, Neb., the resounding answer is: yes, they are. Even though stratification — the non-uniform distribution of nutrients within a soil’s depth, with higher concentrations of nutrients toward the soil surface — does occur in no-till, it should not be a concern. In fact, they say it’s a natural phenomenon and as long as you’re managing your no-till system properly, you shouldn’t have a problem. When you fertilize your pasture, your rangeland or your lawn, how deep you till it in? That’s the question Jasa asks farmers who worry about nutrient stratification in their no-till systems. He asks, if you can put nutrients on top in a natural growing system, why can’t they be placed on top in a cropland system? Ward also points out in native prairies, nutrients work their way down into the soil naturally, just as it occurs in no-till systems. It’s why he prefers to call it nutrient distribution instead of stratification. In fact, stratification even occurs in tillage systems. “A lot of people who say there’s stratification in no-till have never measured the stratification of their tilled systems,” Jasa says, explaining that in his research plots he saw just as much stratification in the disk and chisel systems as he did in no-till. Even as tillage continued, there was actually more stratification in tillage than in no-till. The reason for this is a stronger soil structure under no-till. Another reason stratification is not a concern in no-till is because of higher soil moisture, thanks to undisturbed residue. You have to have nutrients in the soil, because that’s where the roots are. You have to roots where the nutrients are. You have to have water where the roots are, because the roots need water to uptake the nutrients. Because tillage dries the soil, there aren’t roots near the soil surface, which means placing nutrients on top of a tilled soil won’t work because there won’t be roots there. But in no-till, if residue is left on top of the soil, there will be moisture, and if there’s moisture, there will be roots. In fact, studies have found that no-tilled crops tend to have greater uptake of surface-applied fertilizer than conventionally tilled crops. According to a paper written by University of Kentucky soil scientist John Grove, Ward and University of Maryland soil scientist Ray Weil, research conducted in Kentucky from 1980-81 looked at corn’s uptake of surface-applied potassium under moldboard plowed and no-tilled plots that were established in 1970. Despite the fact that potassium stratification was “substantial and more pronounced” in the no-till plot — 170 ppm for a 2-inch soil depth vs. 132 ppm in the moldboard plowed plot — potassium uptake of the no-tilled corn was 130% of the moldboard-plowed corn. 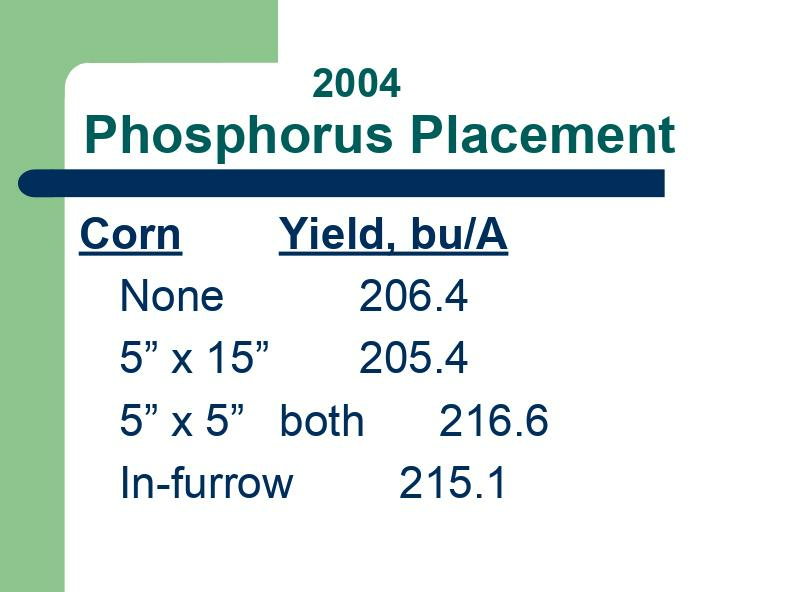 Jasa’s research also supports that placing phosphorus higher in the soil for corn performs better than phosphorus placed deeper. The corn that received the 5x5 and in-furrow placements both yielded around 10 bushels higher than the other two applications, and Jasa notes that the 5x5 and in-furrow were statistically the same yield. In 2005, Jasa tried a few more placement options, including application through a strip-till bar (5x0 treatment), a grain drill to band phosphorus 2 inches deep on 7.5-inch spacing, and phosphorus dribbled on the surface on 7.5-inch spacing. 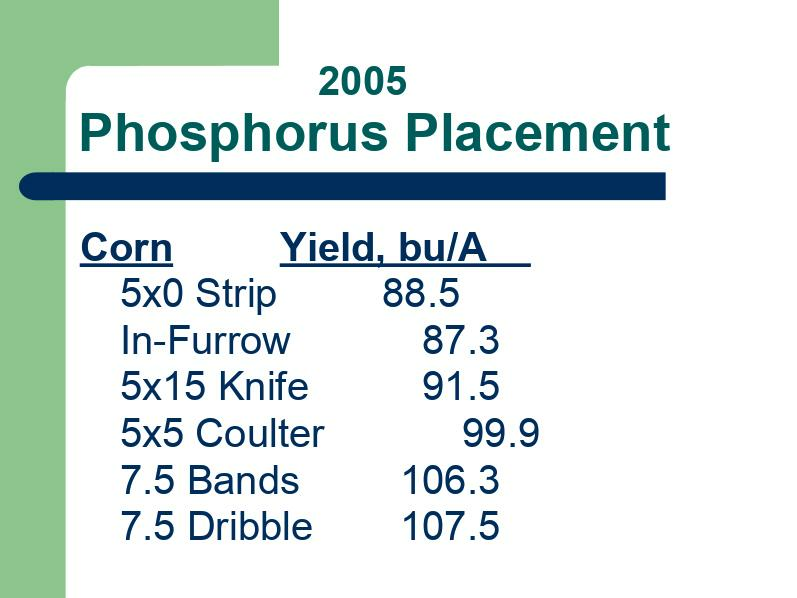 Noting that it was a dry year, Jasa found the phosphorus that was banded and dribbled resulted in the highest corn yields. Because the roots need soil moisture to absorb fertilizer, leaving crop residue on the soil is key to maintaining that moisture. Jasa says he likes to see 100% residue coverage until the crop canopy takes over, but growers need at least 90% to reduce evaporation from the soil surface, according to irrigation engineer Norman Klocke. Why do you need so much residue? Jasa says that Klocke gave him the example of an energy-efficient house. If someone leaves the front door open, it doesn’t matter how well-insulated the house is — the heat is going to escape. Soil moisture works the same way. Too little residue and the water will find a way to escape from the soil surface. For no-tillers whose soils are so biologically active they have a hard time maintaining residue, Jasa isn’t too worried about them losing some residue. Cover crops can also slow acidification that occurs from surface-applying fertilizer, says Ward. While the calcium-magnesium in corn stalks will help slow it, broadleaf covers contain a lot more calcium-magnesium than grasses, which can help slow it even more. He adds that growers using legumes as covers normally don’t need to apply as much nitrogen to the following cash crop, which also helps slow acidification. But even if soil moisture and acidification aren’t concerns, no-tillers may still want to add cover crops into their systems for their soil health benefits, which in turn improves nutrient uptake. Ward says that covers help soils get their mycorrhizae established, which does most of the nutrient feeding for the crop roots. He notes that soil health is critical in how plants uptake nutrients, so if a grower hasn’t developed the soil health yet, then the plants may not be able to uptake those nutrients, regardless of how and where the fertilizer is applied. One warning both Ward and Jasa would like no-tillers to heed is the notion that they can heavily reduce or even eliminate fertilizer as their soil health improves. Ward says that aside from nitrogen and some sulfur, which plants can acquire from the air, most nutrients that are removed from the soil will need to be replaced. The paper by Grove, Ward and Weil recommends ensuring an adequate or slight surplus of nutrition using shallow subsurface placement or surface applications. Jasa does note that in drier climates, he prefers to place fertilizer in the soil when possible. But as long as there’s adequate residue left, he’s not too concerned, because the moisture should be there to carry the nutrients into the soil. Ward also mentions that areas like the Palouse region in the Pacific Northwest can have dry topsoil from limited moisture, so growers usually put their fertilizer 4-5 inches deep in the soil where moisture is still available. “Now we’re doing no-till, so that’s changed that dynamic some,” he says. Farmers growing crops that are sensitive to residue also may need to adjust their fertilizer strategies, Jasa says. Canola in particular, he explains, is sensitive to too much residue because the canola seedlings are so small. His recommendation to farmers growing canola and other residue-sensitive crops is to put some fertilizer down in a starter application during planting. So if a no-tiller is running row cleaners on his planter to push the residue away, it’ll provide a bare strip of soil that will warm up and dry out. “When it dries out, the nutrients better be in the soil itself there,” Jasa says. Despite some suggestions that no-tillers should be soil sampling at shallower depths because of stratification, when it comes to taking soil tests for fertilizer recommendations, Ward does not recommend no-tillers do anything different. The reason for this is due to how the soil tests are calibrated. While in Nebraska the tests are calibrated for an 8-inch depth, in most states it’s a 6-inch depth. If a grower submits a sample that’s at shallower depth, the calibration will be off, Ward explains. And because the nutrient concentration is higher at the top, he may get a lower fertilizer recommendation than what is needed and end up under-fertilizing his crop. “The roots grow down 4 to 6 feet deep in the soil,” Ward says. “So we’re estimating from the top 6-8 inches of soil what that plant needs, when it’s growing 4 to 6 feet. So if you start sampling different depths, you’re going to get a different reading than if you were to sample 0 to 6 inches or 0 to 8.